Wanted…The Loomis Gang is a broadside advertising a reward for information leading to the arrest of various members of the notorious Loomis Gang of Madison County, NY. 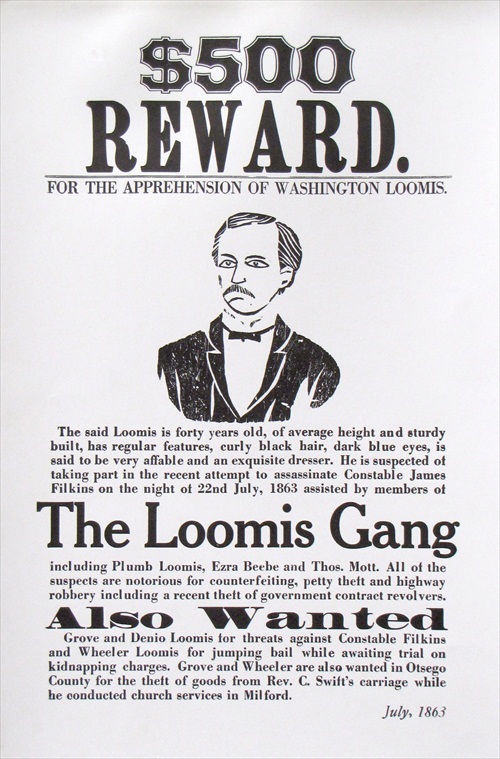 It is doubtful that any wanted posters ever existed for the gang since everyone knew where to find them; the problem was in holding and convicting them. Our Master Printer, Ted Shuart was talked into printing this poster by a descendant of the family and found himself printing many more by popular request. The information on the poster is all factual and comes from a variety of sources. The poster is printed on a Washington press using hand set type and a handcarved wood cut. Printed materials reproduced in the Middlefield Printing Office at The Farmers’ Museum are carefully researched to be historically accurate for the 1845 time-period portrayed at the museum. The printed pieces are inspired by actual examples found in the collections of the New York State Historical Associations. Type is hand set using antique metal or wooden type and produced on the museums historic printing press. Items are printed on 25% rag paper using a waterproof, rubber based ink. Broadsides can also be printed on heavier stock poster board for an additional charge. Period Broadsides and hand bills produced at The Farmers' Museum focus on an 1845 theme and feature a wide range of topics from stage coach schedules to laughing gas exhibitions. These are printed on an antique Washington press using original type from our collections. Every attempt is made to reproduce the materials to look like the original product.